Flowers and insects seem so fleeting until they attract Peggy Ballard’s jewelry-making interest. 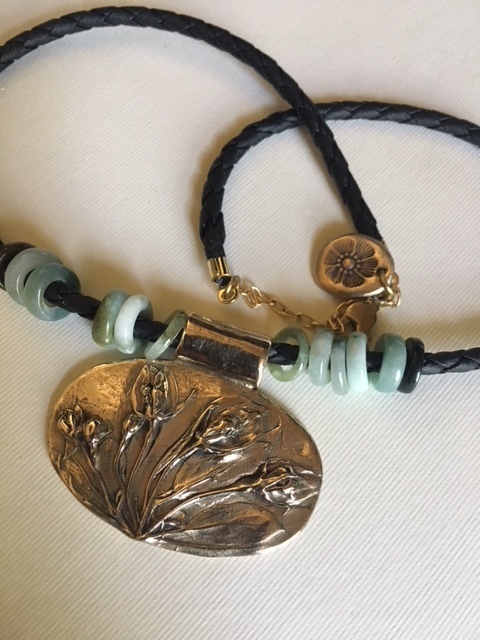 This month’s Alliance Art Gallery’s spotlighted member Peggy begins her pendant design with a transference that will connect nature to necklace. With 20 years experience and much experimenting, her bronze or silver necklaces go through an exhausting process. It begins when that tiny bit of nature is pressed into soft fluid metal clay. When dry, Ballard removes the biologic fragment, cleans the clay replica, and presses it into the mold. Once dry and very clean, pendant goes through sanding, two hours in a 1625-degree kiln, more cleaning, two hours in a tumbler, seven levels of polishing, and a fine coat of museum quality waxing. “I started in bronze,” she explains, “because the size I was working with would be too expensive in silver. After I got comfortable with bronze, I moved into silver.” It took time to perfect her technique, using different mediums to capture the imprint. Today, her pendants have images on both sides—the back always being a leaf motif made from actual leaves. Initially Ballard’s pieces made their debut in family settings as gifts. Then one day a jewelry-making friend suggested that they do a pop-up show that allows jewelers to showcase their latest work for one day in one place. Pop-ups became quite popular but after several years, Ballard prefers to work with stores carrying high end jewelry, and the Alliance Gallery. Her jewelry collection augments her 2D collage work, also in the Gallery. In all her work, Ballard looks beneath the surface of things, juxtaposing image and material. In the case of her jewelry, she celebrates the tiny celebrations of nature, often not seen in our busy lives yet when seen, astonish us with the beauty of the tiniest among us. An opening reception will be held Saturday, September 8, from 5:00 until 8:00 pm. A piece of Peggy’s work will be given away in a free drawing held at 6:00. This reception coincides with Hannibal’s Second Saturday Gallery Night.